One year ago, Motorola, fat and fed by its Google acquisition, inched quietly into a silicon-spun cocoon to gestate. The subsequent passage of time allowed it to transmogrify and re-emerge a thing of red, yellow, blue and sometimes green beauty; a Google thing made by a Google company. The Moto X, its newborn monarch, arrives in an array of different colors, made possible by the NikeID-like Moto Maker site. It also comes with a homespun narrative: it's assembled here in the USA. Time to empty your wallets, patriots. This is America's smartphone and it costs $199 on a two-year contract. If I'm right in reading between the lines of Google's marketing speak, the Moto X was made in the image of the everyman. It's the product of a democratic process -- you can take that future design poll on Facebook as proof of this point. The 4.7-inch screen size, the curvature of its back, the composite materials, its weight and front-face look were focus-tested for maximum inoffensiveness. The Moto X exudes no tech halo like the Galaxy S 4 or the HTC One because it is the sum of averages. Here's how I see it: You know those people who own iPhones, but don't know which model number they own and also refer to all Android phones as Droids? This phone is for them. 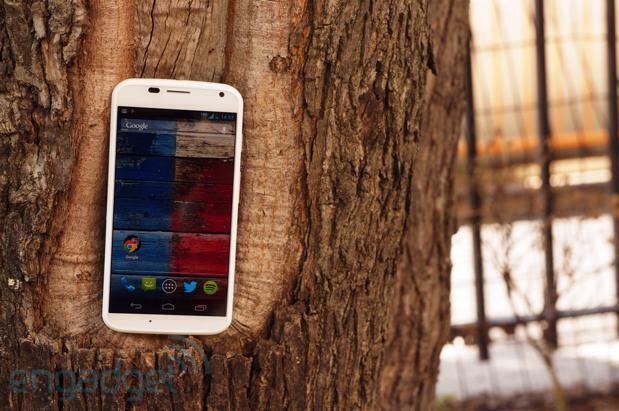 The Moto X hits a sweet spot with its user-friendly, always-on software features. At $199, though, it's priced a bit too high for a mid-range phone. 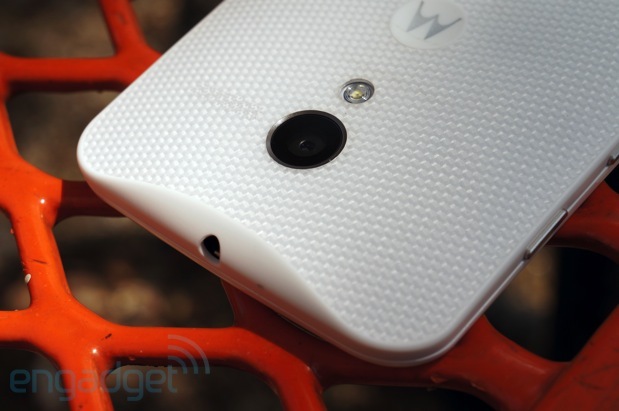 How would you rate the Moto X? I've had the Moto X for five days now and the bond I've formed with it has nothing to do with its body. In the sea of tech products that litter my home, the Moto X is the least conspicuous -- my eyes are never drawn to it. The woven white unit, a Verizon variant, is too plain-Jane for my tastes. It's unspectacular, but that superficial fail can be easily overturned by a visit to Moto Maker. Having seen the litany of custom hues possible at the product's unveiling, I can assure you, the Moto X's beauty is truly in the eye of the prospective owner -- a luxury sadly reserved for AT&T at launch. And just wait until you can get a wooden Moto X. As soon as Motorola's wood-backed prototypes pass testing and hit the market in Q4, I'm confident the Moto X'll become the "it" phone to have, the new black... the new-iPhone-that-isn't. 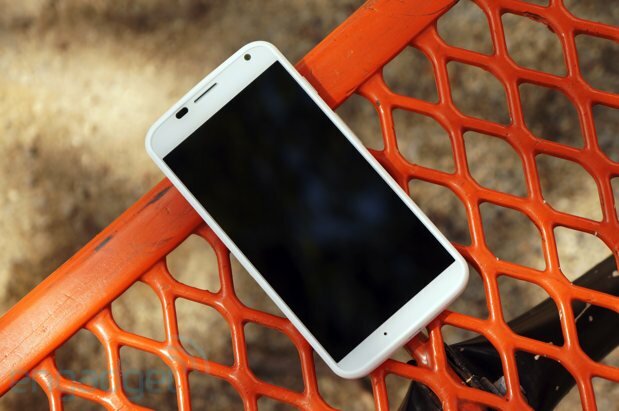 Motorola never specified just what materials make up the 130 grams that is the Moto X's composite shell, but you can safely eliminate Kevlar and metal (Droid staples) from that list. The backs of the woven white and black models have a trippy, Magic Eye-like effect, with a 10.4mm thickness that tapers to 5.6mm at the edges. Centered on the uppermost part of this backplate is the 10-megapixel ClearPixel rear camera with an LED flash below and speaker grille to its right. Motorola's "M" logo lies just beneath in a circular depression that's acutely placed; here is where your pointer finger will naturally rest when holding the phone. From what I've seen of carrier-locked models, branding for each operator will appear towards the backplate's bottom end and nowhere else. Remarkably, it's even somewhat demure, as Verizon's silvery logo, and that of the AT&T models we've seen, have a way of fading into the background. Quality craftsmanship isn't the first association that springs to mind when looking at the Moto X. 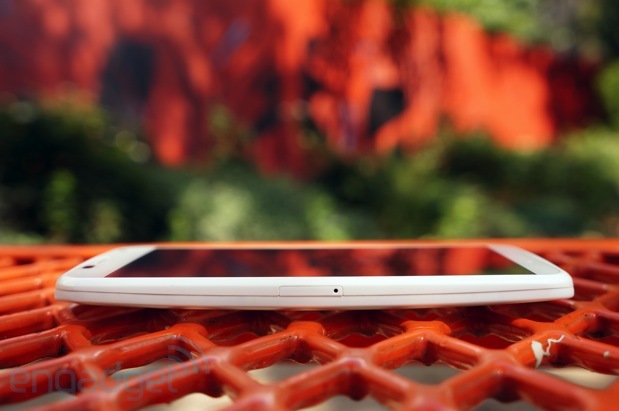 The glossy white plastic that frames the device looks chintzy. I use the HTC Droid DNA on a daily basis -- a phone that also retailed for the same $199 contracted price -- and despite the obvious design similarities (curved back, blunt edges), the Moto X ends up looking like a Fisher-Price toy in comparison. But much like those toys made for toddlers, the Moto X also looks like it's prepped to endure hard knocks and drops. That precious woven white backplate, however, will get messy. I know because within one hour of owning the device, an innocuous rubber stand we'd used as a photo prop managed to scuff the backplate. No amount of soap, water or Clorox wipes were able to completely eradicate these dark black scars. Keep that in mind when you're making your purchase. 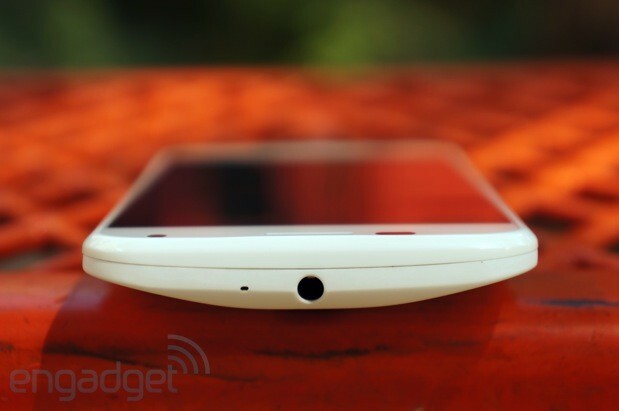 Like the bellies of swans, the white Moto X's backplate can get ugly pretty quickly. The volume rocker and power button, both slivers of painted plastic on the device's right edge, are loosely secured and flimsy. They actually make a slight noise when you jiggle them in their sockets. I don't know about you, but when I plunk down $199 and sign away two years of my life to a carrier, I want to know that the two buttons used most on a phone will be sturdy and everlasting. Which doesn't appear to be the case here. Moving on, smack dab atop the Moto X's sloping top edge, you'll find the 3.5mm headphone jack, while the nano-SIM tray, which requires a pack-in key (or paper clip) to open, occupies the left edge and, finally, the micro-USB port lies at the base. 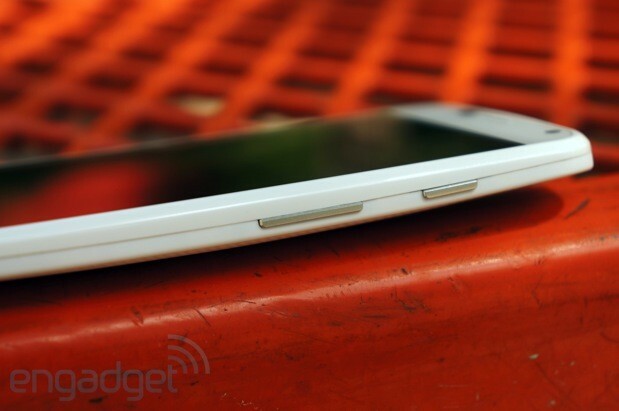 Remember the "edge-to-edge" claims Motorola made with the Droid RAZR M? The Moto X is launching with nary a mention of that jargon. But Motorola's Rick Osterloh, SVP of Product Management, did tell us that 70 percent of the device's front face is all screen. And with the Moto X's reliance on Android soft keys for navigation, that particular boast is unsurprising. Head-on, the Moto X is anonymous -- save for a 2-megapixel camera, earpiece and ambient sensors up top, all branding has been stripped from it, thankfully. Neither you, nor I need to be constantly reminded of the manufacturer and carrier when staring at our phones. Buying the phone, using it on a daily basis and paying the monthly wireless bill are reminders enough. So kudos to Motorola for avoiding that stamp of corporate insecurity. Yes, 1080p panels make for great bullet points in device announcement posts and headlines -- even as talking points in podcasts. But let's be real, for those folks that don't pretend to know the difference between AMOLED and Super LCD 3, 720p is good enough and especially on a 4.7-inch screen. The Moto X's AMOLED display packs a pixel density of 316 ppi, looks great from most any angle and has that signature vibrant pop of saturated color associated with this panel type. In short, I like it and you will, too. That said, it's not the brightest display I've ever seen on a smartphone and the glaring light of a bright summer sun does make it difficult to discern onscreen content. When you first power on the Moto X, you'll be treated to the new Motorola boot animation; one where the "M" logo is its own world, literally. A couple of things are presented to the user before delving into the typical Android sign-in procedure. First, users will be allowed to opt-out of data collection and then they're prompted to take advantage of Moto Migrate, a new tool that requires the installation of a similarly named app on your soon-to-be-former smartphone for data migration. I've yet to test this tool because I prefer a virgin experience with any new smartphone and an unfettered view of any existing app bloat. Despite being the product of a Google company, the Moto X does not ship with Android 4.3 out of the box, nor is it immediately receiving that over-the-air update like its Nexus brethren -- perhaps the confirmed Google Play edition will. Instead, it comes with an almost pure version of Android 4.2.2 Jelly Bean. It's not lightly skinned in the way last year's Droids were, what with their use of different icons throughout. 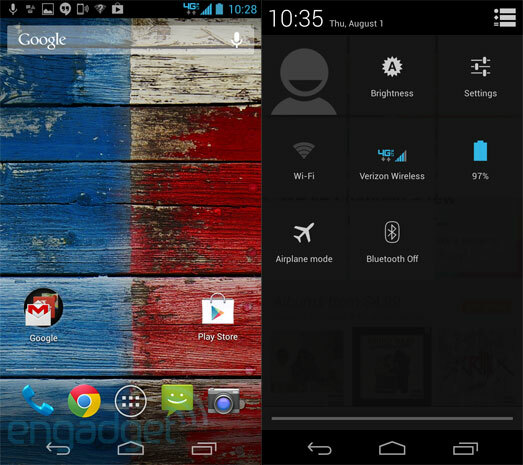 Jelly Bean on the Moto X looks near identical to stock Android. It's the minor customizations Motorola's made to the camera UI, notifications and always-on voice commands that separate this from the Nexus line; tweaks you'll wish Google would carry over to stock. Among these tweaks, my favorite, and what should be considered Motorola's new killer Android feature, is Active Display. This is, in a sense, what makes the Moto X smarter than your average smartphone and one of the reasons Motorola developed that specialized contextual computing core. Pull the phone out of your pocket and a portion of the display immediately illuminates with the time, any new notifications and an unlock icon. You can even preview those lingering notifications by tapping the blinking icon onscreen and then fully access them by sliding your finger upwards. Not to worry, you can manage which notifications show up, when they do or even prevent them from displaying altogether when using password protection in this sleep mode -- called a "breathing cycle," since it fades on and off once triggered. Active Display can also be initiated by flipping the phone over, specifically if it's been face-down on a table while you're at a meeting or eating out with friends. I haven't really found much use for Touchless Control, the always-on voice recognition feature launched by saying, "Okay, Google Now." I'm sure there will be instances where I'm otherwise occupied and will need to shout at my phone for assistance, but it still seems to me a gimmick. One thing's for sure, you won't ever have to worry about friends, family or pesky strangers accidentally launching the feature. There's a three-step personalization process when you first start it up to prevent that and it's kind of foolproof. Trust me, I've tried to trick it with the voices of various friends to no avail. So, what can it do? You can instruct it to place calls, get directions, launch apps, send texts, set alarms and reminders, ask questions and even play music (through Google Play Music). I've gotten particular amusement out of asking it, "Who is Jennifer Aniston?" and then listening to the robo-voiced reply. I'll circle back to Quick Capture, the last of Motorola's custom tweaks, in the camera section. For now though, let's explore the other aspects of Android 4.2.2 on the Moto X, like bloat. Because, yes, it's on there and, yes, it's Verizon's fault. Apps like NFL Mobile, VZ Navigator, Voicemail, Verizon Tones, Quickoffice, My Verizon Mobile, Mobile Hotspot and Caller Name ID all live on the Moto X. (Ugh is right.) What's more, none of it can be uninstalled, only disabled. (Ugh, ugh.) These are in addition to Migrate and Assist, Motorola's duo of actually useful pre-installed software. I've already detailed the purpose of Migrate, so let's talk about Assist. 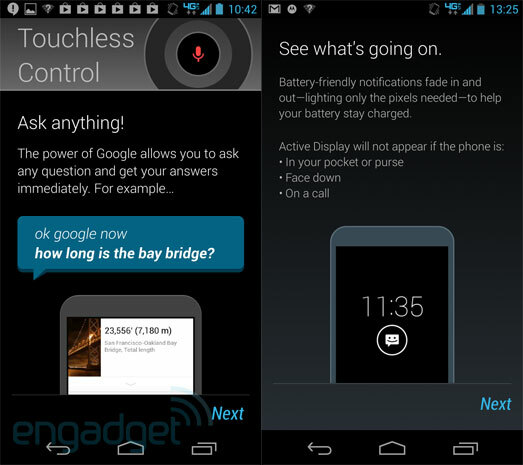 Assist backs up Osterloh's promise of a "smarter phone" that's contextually aware. Case in point, if you want to enable driving mode, which uses the accelerometer and GPS to detect when you're behind the wheel and then reads your texts and phone calls out loud, you'll need to set up Assist. The same goes for silencing notifications during meetings or keeping the phone quiet at designated times while you sleep. Buried in display settings, advanced users will also find an option for Wireless Display. This function uses Miracast to mirror the phone's content on compatible displays and can be toggled on or off. Don't call it an SoC because it's not. The X8 custom architecture Motorola's embedded within the Moto X (and new Droid line, as well) is a combo of a dual-core Snapdragon S4 Pro clocked at 1.7GHz, a quad-core Adreno 320 GPU and two specialized cores -- one for the aforementioned contextual computing, the other for natural language processing -- plus 2GB of RAM. Those latter two custom cores were made specifically to enable optional features like Active Display, Quick Capture and Touchless Control to function in a low-power state. That means that even when your screen's off, these features are only a flip, wrist twist or voice command away. I'll be honest, it does take some getting used to, seeing your display illuminate and then wondering / worrying about the hit on battery life. So far, that 24-hour battery life claim has proven true and that's without the battery saver option turned on. Lately, the smartphone buzz has centered on processors like the Snapdragon 600, or 800 -- burly quad-core CPUs that translate into nimble performance. Throw something like the mutant X8 into the mix and you're left with confused spec-freaks that don't know how to compare the length of their swords. All we have now is real-world performance. Sure, the requisite benchmark testing is part and parcel of this review, but with recent allegations of rigged results, I'm more inclined to lean on my personal experience as a yardstick and not a chart of numbers. It was Steve Sinclair, VP of Product Management at Motorola that referred to the Moto X, more than once, as being "butter smooth." He was, of course, alluding to Project Butter, the 60 frames per second made possible by Jelly Bean. And he was right, the Moto X does glide along in every action. The transitions are smooth and the app launches are seamless; nothing about its performance is herky-jerky. Take my word for it. I'm what you'd consider a heavy user, with tons of tasks living in the background at any given moment, and I've yet to witness the Moto X flinch. It's that good. It also never heats up in hand. Thank you, Motorola. Alright, let's move on to benchmarks. Take a look at the chart above and you'll see there's not one clear Android rival for the Moto X. Its $199 on-contract price is the sole commonality between it and current Android kings: the Galaxy S 4 and HTC One -- Google's Nexus 4 is the lone outlier. Pitted against those two top-tier smartphones and their Snapdragon 600 hearts, the Moto X just can't keep up. It is, by virtue of that X8, comparatively slower, although graphics performance seems to be on par with its rivals since all four share an Adreno 320 GPU. (Update: GFXBench 2.7 score corrected for accuracy) Contrast it with the Nexus 4's Snapdragon S4 Pro and you're looking at a fairer fight, but graphic testing outpaces Google's reference device. As I write this, my Moto X is still carrying a 28 percent charge after one day, two hours, 12 minutes and three seconds. And I'm a heavy user. To give you a better idea of how I arrived at this number, allow me to explain my personal usage habits. Spotify is nearly always running on my phone when I'm in transit, which, here in New York City, means almost any time I'm not sitting. When I'm idling, I usually launch Pocket to catch up on news, voraciously refresh and scan Twitter (set to sync every 15 minutes), have constant emails pouring in and out that I read and respond to, Hangouts that I periodically indulge in, Maps for rushing off to various meetings around town and Chrome for the 20-plus links I have open at any given time. It's sad, but I am that person at dinner or drinks who's always staring at his phone. And that sort of behavior nets you a 28 percent charge on the Moto X after one day, two hours, 12 minutes and three seconds without battery saver enabled. 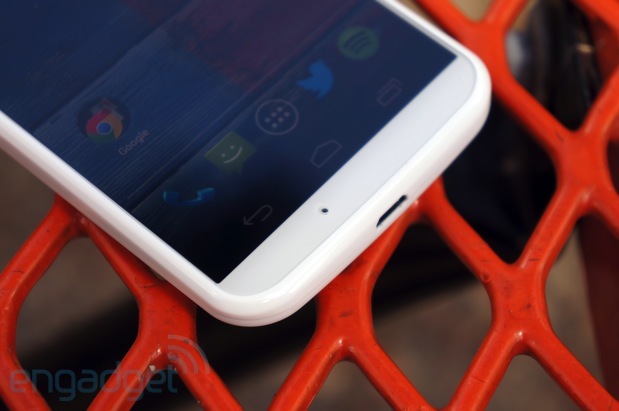 That result bests even Motorola's own conservative claim of 24-hour battery life. Under the strain of Engadget's formal battery rundown protocol, in which an HD video plays on a loop, the Moto X's 2,200mAh cell lasted 11 hours and 15 minutes. Clap your hands, people. This is the battery life you didn't know you were missing. I'm not a cameraphone person -- never have been and never will be. I just don't feel compelled to snap and share photos as much as everyone else on planet Earth. It's that quality that makes me the perfect test case for the Moto X's pared-down camera UI and Quick Capture feature. According to the company, users will be able to wake the phone into camera mode via a wrist-twisting gesture and then capture photos in just under two seconds. There's no dedicated dual-detent hardware key to press, nor is there a software shutter button. You just tap anywhere on screen and the 10-megapixel ClearPixel camera snaps away. And if you continue to hold your finger pressed to the glass, it'll keep on shooting (much like a burst mode) and record the number of images with an onscreen counter. Since autofocus and exposure are automatically handled, the Moto X's camera is basically idiot-proof. You don't need to know what an ISO is or worry about white balance. HDR is even set to auto by default. All that said, you will need to give the RGBC sensor time to adjust to a scene before you snap away. Quickly grabbed shots will often appear out of focus and in low-light conditions, moving objects will appear extremely blurry. So, what is a ClearPixel and why should you care? Simply put, it collects more light and takes better pictures on the fly. On a more technical level, the f/2.4 lens and 10MP sensor inside the Moto X's rear camera module gathers up to 75 percent more light than a typical RGB sensor, making it great for low-light performance and overall faster exposure times. But, like I mentioned before, you can't just tap and snap immediately; you have to allow the Moto X to adjust. Otherwise, you wind up with a widely varying exposure and soft-focus shots. Speaking of focus, you can enable tap-to-focus from within the left-side slide-out settings wheel, in addition to setting toggles for HDR, flash, Quick Capture, slo-mo video, panorama, geo-tagging and shutter tone. And now, a word about the Quick Capture gesture. It's really fun to use once you get the hang of it. I'll be forever grateful to the Motorola rep that explained the motion to me as "turning a doorknob back and forth." Because, that's the exact motion you need to emulate to get it working. I've let many a friend and family member test it out using that explanation and the resulting reaction has been unanimous: people love it. Sure, it'll garner you some stares from passersby, but who among you doesn't want to show off their newly acquired mobile kit? The 16:9 shots I captured in my downtown New York City walkabout are vivid and crisp, but that's because they were mostly taken within a shallow depth of field. Move out of this and you'll start to lose detail. Color reproduction on the whole is natural, but that also depends on the exposure -- it can be hit or miss. Macro shots came out in great detail, but the same cannot be said for fully zoomed-in shots. There's just too much loss of detail there to be workable (a Lumia 1020, the Moto X is not). Also, 1080p video recorded on the Moto X is good, not great. The AF adjusts as you move the camera, but as you'll notice in the sample video, frame rates for nearby moving objects are bizarre and resume normality as the object moves out of range. Audio playback is pretty clean thanks to the three noise-canceling mics placed around the device. Motorola won't reveal the Moto X's off-contract pricing -- not yet, anyway -- which leaves us with a $199 on-contract mid-range device. That's unfortunate because the Moto X would've been better served by a price of $99, a typical MSRP for a mid-range device. Oh well. Since Motorola's positioned its hero device in the big leagues, ostensibly forcing consumers to choose between it and similarly priced mega phones -- the GS4 and HTC One -- here's how that rivalry shakes down. For $199, both the GS4 and One will get you a 1080p display (screen size varies from five inches to 4.7 inches, respectively), Snapdragon 600 CPU, 2GB of RAM and some version of Android 4.2 Jelly Bean. Where those two handsets differ is in memory allotment: the One comes with a non-expandable 32GB of internal storage, whereas the GS4 packs 16GB standard plus up to 64GB via microSD expansion. Or, for something a little less robust, you can go the Nexus 4 route and spend $299 outright. That'll get you considerably less storage, only 8GB, but a screen size similar to the Moto X, a Snapdragon S4 Pro processor, the same amount of RAM, as well as access to the absolute latest version of Jelly Bean (4.3). As an alternative to Android, there's always the 16GB iPhone 5 for the same on-contract pricing. What you gain in ease of use and ecosystem, however, you trade-off in size: the iPhone 5's Retina display is four inches -- a dwarf by today's standards. 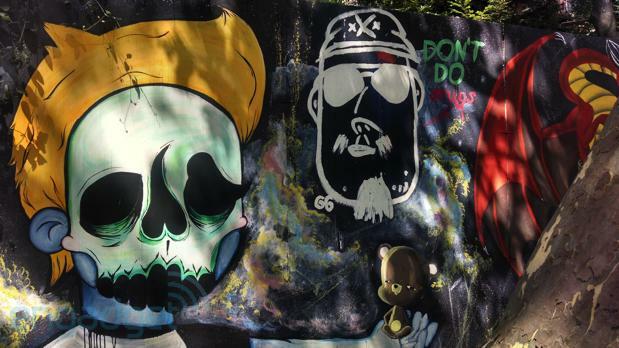 I like the Moto X. I really, really do. It's the smartest smart object I'm currently carrying on my person and I'm too used to that Active Display to calmly resume life with my DNA. That affinity, however, doesn't necessarily mean I'd buy it if given the chance. The price is just too darn high for what's on offer. In a market where phones with higher-res displays, greater storage and faster processors are a mouse click away for $199, the Moto X just can't compete. But that prognosis changes dramatically when you factor in Moto Maker. I'm almost confident that the Moto X would be a runaway hit ($199 price be damned) if Moto Maker were a standard option for all five US wireless carriers. That it isn't is troubling and, for now, only AT&T subs will have access to the NikeID-like customizations come launch. And then there are the wood-backed Moto X variants coming this Q4, the tantalizing promise of which could keep consumers from buying in now. I like where this new Motorola's going: the personalization, the few, focused user-friendly enhancements, the stellar battery life and crowdsourced design. If only its launch execution were a bit smarter like the Moto X, a bit tighter (that wood option should've been ready) and a bit more accessible (Moto Maker for all! ), regardless of carrier. Motorola, let this butterfly fly free.